Paving the road to 20TB by 2020. Seagate said back in 2013 that it hoped to release a 20TB hard drive by 2020 using its then-new shingled magnetic recording (SMR) technology. Fast forward to today and the biggest capacity HDD it offers is 10TB, though the company's roadmap includes 14TB and 16TB HDDs within the next 18 months. Company executives provided the capacity update during an earnings call this week, PCWorld reports. Seagate CEO Stephen Luczo said that 12TB HDDs based on helium technology are currently being tested, but that even more capacious solutions are not that far off. Hard drives have been losing ground to solid state drives over the past several years, though HDDs are still in demand because they offer far more capacity for less money. 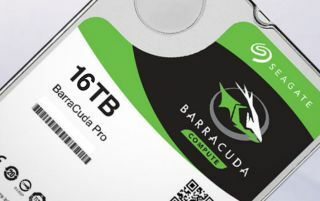 Companies such as Seagate have also been able to sell premium priced HDDs at the upper end—a 10TB HDD runs north of $400, depending on the model. While consumers are still interested in large capacity HDDs, Luczo says Seagate is seeing demand from other areas as well, such as surveillance setups. Seagate even has a line of HDDs dedicated to surveillance, its SkyHawk series, which is optimized for DVRs and NVRs with specialized firmware that is supposed to enable smooth, clear video streaming for always-on applications. NAS (network-attached storage) is another area where large capacity HDDs are proving popular among consumers. And of course enterprise clients are drawn to capacious HDDs for servers and data centers. Seagate raked in $2.9 billion in revenue during its second quarter for fiscal year 2017, which led to a profit of $297 million. Hard drive sales accounted for nearly $2.7 billion, with SSDs adding comparatively little to Seagate's bottom line.